Arguably the three toughest home games this season were the first three. The Seahawks have survived the gauntlet. The Seahawks beat the New England Patriots 24-23 on Sunday, improving their record to 4-2 and are now in a three-way tie for first place in the NFC West. The Seahawks are also 3-0 at home. This was yet another incredible game to be in attendance for. Here are my thoughts about Sunday’s victory. Defense Showed Up When It Absolutely Needed To: The Seahawks defense came into this game as the top defensive unit in the NFL. After giving up 475 yards to New England that will most likely change. With the exception of the final Patriots drive of the first half and the last two at the end of the game, the Seahawks defense was virtually nonexistent. The no-huddle offense Tom Brady called worked extremely well, especially the running plays called on first and second down. However, the stops the Seahawks made in the periods previously mentioned ultimately determined the outcome of the game. With 6 seconds left in the first half, the Seahawks pass rush forced Brady to throw the ball out of the endzone. The officials called intentional grounding on Brady which required a ten-second runoff to end the half. The Patriots took a gamble and missed out on 3-7 points. After the Seahawks scored with 1:16 left in the game, I was worried that we left too much time for Brady since all the Patriots needed to do was get into field goal range. The sack on Brady on second down was huge and that backed them up enough for the Seahawks to make sure the Patriots would not convert. The pass rush as a whole was disappointing but the Patriots offensive line did a great job. Holding the Patriots to 23 points is great but the yardage given up needs to be improved. Finally! : Russell Wilson threw for more yards in this game than any other game this season. Wilson ended the day 16/27 for 293 yards, three touchdowns and no interceptions although he turned the ball over once on a fumble. Wilson showed that he can fire down the field with no hesitation. This was proved with two 45+ yard throws; one to Doug Baldwin which set up Baldwin’s touchdown reception and the bomb to Sidney Rice with 1:16 left in the game. Wilson throws a beautiful deep ball and he did a great job exploiting the Patriots pass defense which is ranked among the worst in the NFL. A game like this against a legitimate super bowl contender should prove that Wilson is drastically improving and that he is going to be a star caliber quarterback really soon. I was incredibly impressed with Wilson on Sunday. I am convinced now that Coach Carroll made the right choice naming Wilson the starting quarterback. Richard Sherman Is Gary Payton With Shoulder Pads: I have talked about how much I love Richard Sherman. He is a nice, intelligent, and witty person and a hard-hitting, trash-talking, confident football player. 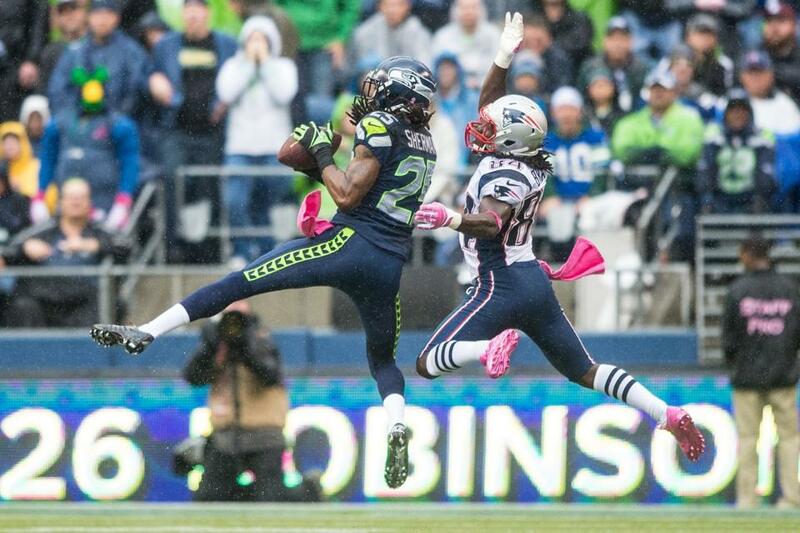 Sherman loves to get into his opponent’s head and his best challenge yet was to Tom Brady on Sunday. Brady told Sherman to meet him after the game after the Patriots won. Sherman challenged Brady to throw against him. With Tom Brady always wanting to prove to his opponent that he is better than them, Brady did in fact throw in Sherman’s direction. Sherman made him pay. He intercepted a pass intended for Deion Branch. After the game, a picture surfaced online of Sherman appearing to continue trash talking to Brady. Sherman already has 3 interceptions and is on pace for 9 or 10 on the season. The performance by Sherman is a tip of the cap to not only him but to the playing style of the rest of the secondary. He is developing an on-the-field “bad boy” image much like Gary Payton was with the SuperSonics during his career. I look forward to see what Sherman will do or who he will call out on Thursday against San Francisco. A New Number In The Rafters: At halftime, the Seahawks retired #96 for Pro Football Hall of Famer Cortez Kennedy. The Seahawks presented him with his Hall of Fame ring, a framed jersey from Kennedy’s playing days, a video montage of his career highlights, and then took a cover off his number in the rafters at CenturyLink Field. It was an incredible ceremony and I got emotional to be honest. Kennedy definitely deserves the honor he received on Sunday afternoon. I am so proud that he is a Seattle Seahawk and now the rafters are completely full with all the numbers that should be retired by this organization. The best part about the ceremony was that it was done at halftime; not at the two-minute warning like Walter Jones’s number. It was nice to see everybody close to Kennedy be here to help celebrate this amazing achievement. And I also think the ceremony may have given the fans the extra juice to scream and get excited during the second half. Random Thoughts: I have now been asked to sit down at every regular season game so far. Once again, I stood up; not to piss them off, but because I couldn’t see due to everyone standing below me. At the next game, I am seriously considering wearing a sign on the back of my jersey that says something like “I don’t sit. Deal with it”… Bill Belichick wore his famous hoodie. What is funny is that Coach Carroll also wore the same style hoodie… I am so glad I got to see Tom Brady play live. I’m even happier that I got to see the Seahawks beat him… Wes Welker and Danny Woodhead are so short. Even from the upper deck they look like hobbits… The starting defense was introduced this week. Fitting considering that we have the best unit in the league… This was one of those games where the weather is so borderline I didn’t know whether to wear shorts and a sweatshirt. That is exactly what I decided to wear with my jersey… Thank God for undercover seats. It poured throughout the entire game… Russell Wilson had trouble throwing the wet football. He should practice with the wet ball a lot in practice for the duration of the season… The Seahawks uniform combination was blue jersey/blue pants. That is probably going to be our look at home for the remainder of the season… I tailgated in a parking lot in Pioneer Square across from the Last Supper Club. Super fun, especially when Fireball is present… Walter Jones raised the 12th Man flag this weekend. I was kind of disappointed however because the video they played for Jones prior to him raising the play was the exact same video they played before he rose it at the NFC Wild-Card Playoff against New Orleans in 2010… It was Canada Day this week. Kind of ironic however, because the Seahawks were playing the Patriots… Free stuff counter: IHOP pancakes and beef jerky and Slurpee’s from 7-Eleven. Almost got a free doughnut from Top Pot but Sidney Rice came 19 yards shy of 100… The post-game party took me to 88 Keys where one of my roommates and I watched the first part of Sunday Night Football, drank a bucket of beer, and celebrated our amazing win with dozens of Seahawks fans… I think the Seahawks have a really good chance of going 8-0 at home for the first time since 2005; the year we went to the super bowl. The Seahawks now face a short week in preparation for the San Francisco 49ers on Thursday night. This means I also have a short week to write my preview post for Thursday’s game. Look for my preview of our game against San Francisco on either Wednesday night or early Thursday morning before my flight takes off for San Francisco. Thanks for reading everybody! Go Seahawks! Tom Brady faces off against the Seahawks in Seattle for the first time in his career this Sunday as the Patriots come to town in a huge test of top offense vs. top defense. The Patriots enter the game 3-2 and they are coming off a 31-21 win over the Denver Broncos. The Seahawks return home from Carolina where they beat the Panthers 16-12 last week. The Patriots lead the all-time series 8-7. The last time these two teams played was in 2008. 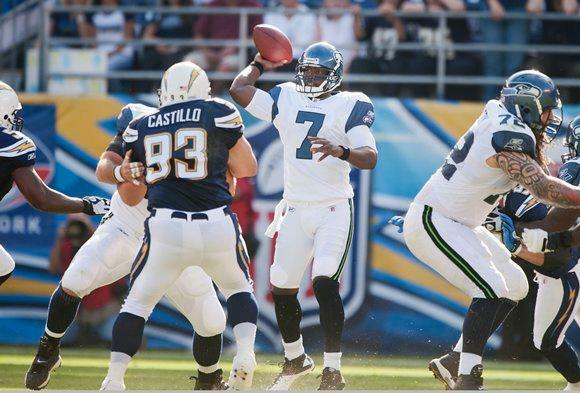 The Patriots defeated the 2-win Seahawks 24-21 on December 7th, 2008 with Matt Cassel at quarterback for the Patriots. Here are the storylines I will be looking at this week in arguably the most anticipated home game this season. Russell Wilson has continued to improve each week despite lackluster statistics. This week he faces the Patriots and their 30th ranked pass defense. With a beastly front four which includes Vince Wilfork, it may be difficult to run the ball this week. If this is the case, Wilson will be on the spot to make plays. I would definitely look for Wilson to scramble if given the opportunity. This may be a week where Wilson runs for close to 50 yards. One of the biggest keys this week, just like any other week is to limit turnovers. If the Seahawks can keep the ball for as long as they can and limit the time Tom Brady is in control of the Patriots offense, we will have more room to breathe and will put increasing pressure on New England. The longer we have the ball, the more pressure put on Brady and the Patriots. The Seahawks boast the number one overall defense in the National Football League. This year especially, the Seahawks defense has done a great job of making opposing quarterbacks look silly. Aaron Rodgers was sacked 8 times in the first half alone and the explosive Packers offense was only able to score 12 points. 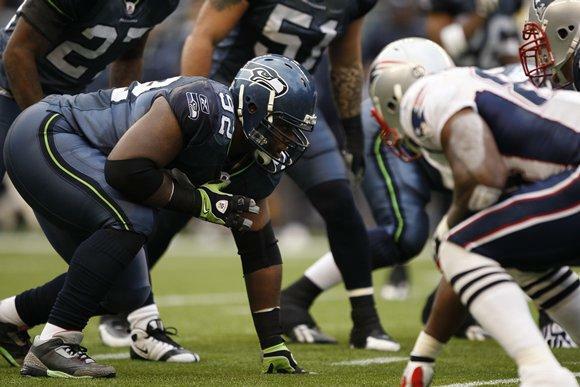 With a beat up offensive line including a hurt Logan Mankins, the Seahawks have the potential to have a stellar day. Behind the roar of the 12th Man, expect the defense to put immense pressure on Tom Brady to flush him out of the pocket or make snap decisions. 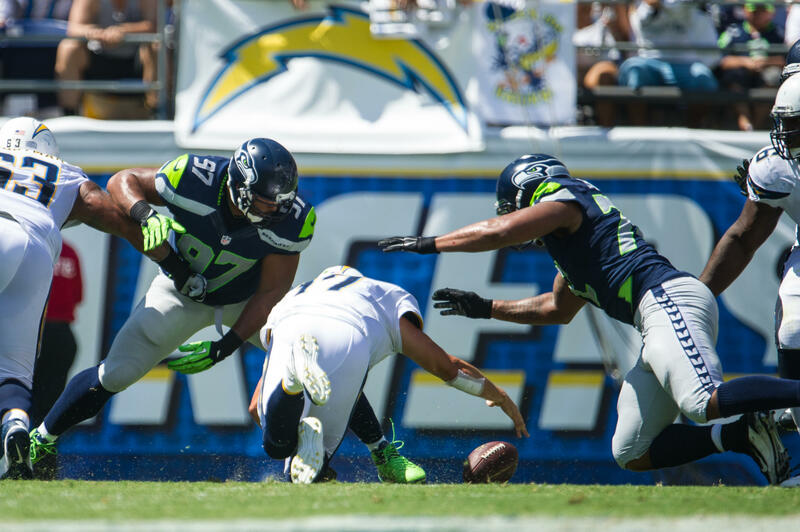 Bruce Irvin is the man to watch this week. In 5 games this season Irvin has 4.5 sacks. He is on pace for 14.5 sacks on the season. After a multi-sack game during the last home game I would not be surprised at all to see him repeat those numbers this weekend. Expect the nickel package to be used more this weekend. The Patriots like to use all of their weapons in different packages and formations. The Patriots will use Brandon Lloyd, Deion Branch, Wes Welker, Julian Edelman, Rob Gronkowski, and Danny Woodhead all throughout the game. The only set matchup I see is Lloyd vs. Brandon Browner; the number one cornerback. Marcus Trufant may have a big role this week. Trufant is the number three cornerback on the depth chart and is used primarily in the nickel package. With the cornucopia of receivers the Patriots have at their disposal, we may see more secondary players on the field at irregular times. With the difference in normality within certain defensive packages against this complex New England offense, players that normally do not make an impact may be able to make plays this week if the rush can force Brady into bad decisions. The no-huddle offense has become a staple of the New England offense this season. According to Coach Carroll, the no-huddle offense is difficult to run with a roaring crowd; mainly due to the difficulty of communication between coach and quarterback. If the Patriots can put up some points early and put the Seahawks in a disadvantage, I would expect to see no-huddle called to sink us even further. Random Thoughts: This is the first time I will be back at CenturyLink Field since Monday Night Football against the Packers. We are coming off a win and are in striking distance of the Cardinals and 49ers. I expect the crowd to be in their seats early and be as loud as the past two games… It is the only home game during the month of October for breast cancer awareness… This will be the best halftime ceremony I have ever been a part of. Cortez Kennedy will have his #96 jersey retired. I’ll have to remember to bring a couple tissues. I teared up during Walter Jones’s jersey retirement… I am super excited to see Tom Brady play live for the first time. This will be one of those games where I look back and can tell my kids “I got to see one of the greatest quarterbacks of all time play”… Don’t sleep on the Patriots running game. Stevan Ridley and Brandon Bolden are two great backs that can both have a big impact this weekend for New England… I have 30.5 ounces worth of Skittles ready to throw on Sunday. Don’t let me down Marshawn… Tailgating will be done in a parking lot like before the Cowboys game. Very excited… There is a Washington Huskies home game the day before against the USC Trojans. Looks like I’ll have to save my voice for Sunday… Might have to break out the sweatshirt and jeans for the first time this week. Only supposed to get up to 60 degrees on Sunday… The Seahawks will most likely wear blue this week. They’ve worn the blue practice jersey’s all week during practice… Ian Eagle and Dan Fouts have the call for CBS this week. Words cannot express how happy I am that I won’t have to sit through THAT commentary… The pregame giveaway is a lanyard. Was hoping for something a little bit cooler for a game against a team like the New England Patriots… I predict that Bill Belichick will wear his famous gray hoodie… The Seahawks are looking to get to 4-2 for the first time since 2010. A win would be huge going forward, especially since we play the San Francisco 49ers on the road next on five days rest. Prediction: Bear Bryant once said “defense wins championships.” This is not a championship game by any means but it may feel like it. The Seahawks will prove that this statement is true. Tom Brady will be sacked 6 times. The offense will not be spectacular but we will do a good enough job in the red zone to put up points and put continued pressure on the Patriots. I have seen the Seahawks beat iconic quarterbacks such as Brett Favre, Drew Brees, Aaron Rodgers, and Kurt Warner live. By Sunday night, Tom Brady will be added to this list. My review will be up on Monday Afternoon. I will be working on my preview for next week’s Thursday night game against San Francisco in a crammed timeframe so bear with me. Enjoy the game everybody. Go Seahawks!